While wakeboarding may get the TV coverage on ESPN2, most boaters in America are towing tubes for family fun. Suitable for all members of the family, tubes are among the most popular types of towables on the market today. 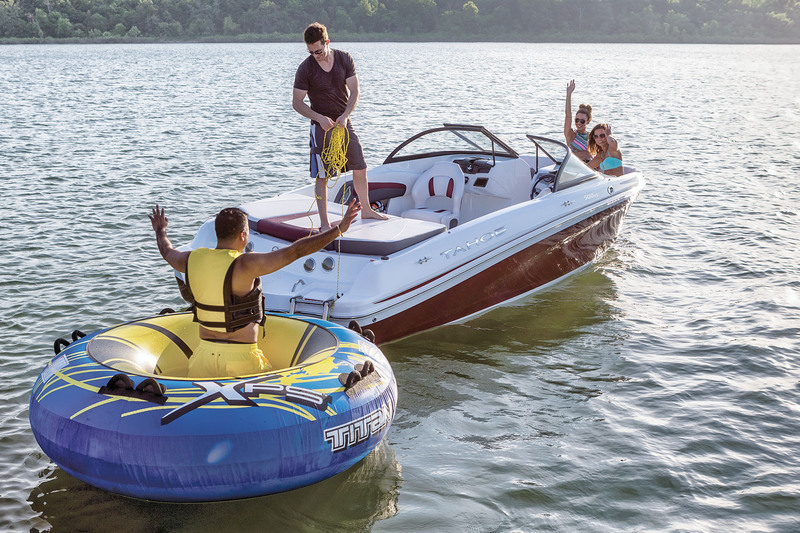 They’re available in a wide range of shapes and sizes, but all are designed with a single goal in mind: on-water excitement. Single-rider tubes are designed for one person at a time and tend to be high-performance items. They’re very maneuverable and well suited for tricks, jumping, and flying at high speeds. They can safely use standard strength ski tube towing line and a standard towing harness. Single-rider tubes are typically more affordable and easier to store than other tubes. The double, just as it sounds, carries two people and is a compromise between a single-rider tube and true multi-rider designs. They allow a bit less speed and are slightly less agile than singles. Multi-rider tubes accommodate two to six people, depending on design. Multi-rider tubes are great for families that want to pull a group of kids or for fun-loving adults who just want to play around. Naturally they are larger, slower and heavier than single-rider models and usually aren’t designed for trick riding. Multi-rider water ski tubes are more expensive and bulkier to store. Multi-person tubes usually require a heavy-duty tow line and towing harness and owners should always pay careful attention to weight and stress limitations. Making sure that riders’ weight in the tube is distributed and balanced properly. A standard tube is similar to the old-fashioned inner tube, but with updated technology. It may or may not have a floor on the inside the hole and will have handles on top. Standard tubes come in both single and multi-rider designs. Deck tubes are flat tubes that look like mattress or an inflatable bed. They usually have handles forward near the edges and are good for high-speed towing. The banana or hotdog tube (or sled) is one of the most popular multi-rider styles. As the name implies, these tubes are long, rocket-shaped cylinders that riders straddle. These are among the fastest multi-rider tubes. A ride-in tube is similar to a small boat in that it cradles the rider. There are numerous other water tube designs that defy categorization, including stand-up chariots, inflatable kneeboards, ride-on-top jet skis and hydrofoil boats. Regardless of the tube you choose, remember that safety is the first priority. Coast Guard-approved personal floatation device (PFD) are a must for every participant at all times. Always use a spotter in the boat. Don’t attempt extreme tricks or stunts that require improper use of your tube. Know the capabilities and limitations of your tube and riders. Choose tubes, activities and speeds that are age appropriate for the rider. (Most tubes are not designed for use by children under six years of age.) Follow the manufacturer’s limits and specifications regarding the number of riders, maximum size/weight, and top towing speed. As a general rule, keep your speed under 10 mph when towing kids less than 12 years old. Tow only in designated areas or spaces away from natural hazards and 50 yards from other boaters.